Unfortunately, some people think that dollhouses are not for boys. This couldn’t be farther from the truth. Aside from the entertainment aspect, dollhouses teach boys many critical skills, such as empathy and communication, they will need as they grow into young men. Many dollhouse manufacturers have also realized the important benefits of dollhouses for boys, and they designed dozens of dollhouses with neutral color schemes that both genders will enjoy. 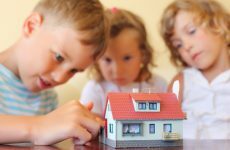 Depending on the age of your son, there are a couple different dollhouses that are best suited for that age range. At this age, your child is just beginning to gain some independence. Dollhouses are a great way to interact with your son and are a fun opportunity to begin teaching speech and proper communication. This dollhouse is simple enough to not overwhelm your son but complex enough to get their mind working as they discover all of the different features. The sides of the dollhouse swing out, allowing enough space for your son and daughter/cousin/friend to play alongside each other. The Little People Big Helpers dollhouse will help your son begin sharing toys and playing together. Your son will love turning the kitchen lights on and off, and pressing the sound and song buttons in the bathroom and playroom. The dimensions of this dollhouse are 6 x 28 x 16 inches and it weighs just over 5 pounds. Many customers purchased this as their son’s first dollhouse. Most were happy with the sturdy construction and value. It appears that most complaints were minor (lack of locking latch) or rare one-off instances (some buttons/pieces missing). Every part of this dollhouse offers something fun and new for your baby boy. The dollhouse comes fully equipped, with each room offering realistic, yet child safe, furniture to enjoy. The Light & Sound Kiddieland My First Sweet Home Dollhouse provides the perfect blend of entertainment and education. The dimensions of this dollhouse are 18.8 x 14.6 x 7.4 inches (perfect for small spaces), with the total weight coming in just over six pounds. The parents that purchased this dollhouse for their son were very pleased overall. It’s definitely worth checking out this dollhouse for your 1-2 year old boy. By this age, you will notice your child starting to role-play with the dolls and having them talk to each other. These dollhouses will provide a fun setting for your boy to begin expanding their vocabulary and imagination. The Pidoko Skylar Dollhouse is a great option if you’re looking for an all-in-one option for your son. This dollhouse comes with 20 pieces of furniture, a 5-person family, and even a pet dog. This dollhouse is very durable since it’s built with premium quality wood. Knowing how rough toddler boys can play with their toys, the Pidoko Skyler Dollhouse should withstand everything your son can throw at it. The overall dimensions are 23.8 x 10.2 x 19.3 inches, and the total weight is just under 14 pounds. The Pidoko Kids Skylar Dollhouse is a favorite among parents when looking to buy a dollhouse for their toddler boy. Children of all ages and genders will enjoy playing with this dollhouse. Melissa & Doug products are known for their high quality, and the Hi-Rise Wooden Dollhouse is no exception. The durable wood construction will withstand any rough play your toddler son can throw at it. What really sets this dollhouse apart is the operational garage door and elevator. Your son will love moving the dolls and furniture from room to room with the elevator. The dimensions for this dollhouse are 13 x 23.8 x 30 inches, and the total weight is 16 pounds. It appears that most complaints about quality and assembly were made a couple years ago. It appears that Melissa & Doug have resolved these issues in their most recent dollhouse. This dollhouse is a great addition for any family, daycare, or library. At this age, your son will create larger role-playing scenarios, often including dozens of his toys while acting out his imaginary setting. These dollhouses provide all the room your boy will need to act out his favorite situations. The Abigail Wooden Dollhouse by Pidoko Kids offers one of the comprehensive dollhouse furniture sets, which includes 40 pieces of furniture, a 4-piece family, and a pet dog. 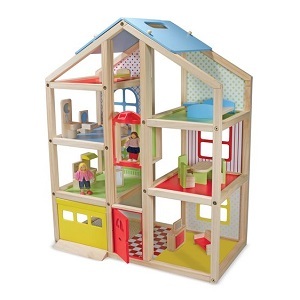 This larger dollhouse is suitable for children ages 3 and up, but is really targeted for kids in the 5-8 year old range. The furniture selection will allow your son to decorate his dollhouse any way he wants, and will really engage his imagination. The dimensions are 23.6 x 11.8 x 28.9 inches, and the weight is just under 19 pounds. Most parents were pleased with pleased with the Abigail Wooden Dollhouse for their sons. The versatility and options this dollhouse provides for your 5-6 year old boy are endless. The Folding Medieval Wooden Castle by Melissa & Doug is a terrific option if you’re looking for a unique and entertaining dollhouse. The working drawbridge, removable turrets, and a trap door will make it fun and easy to play with your son. Their imagination will run wild as they explore the two levels of play area, which include towers, balconies, and archways. The overall dimensions are 20.2 x 18.6 x 15.3 inches, and it weighs 12 pounds total. 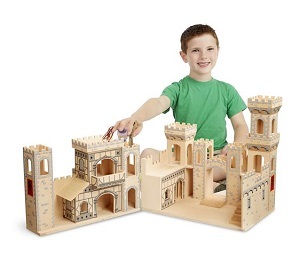 If you’re a fan of the Melissa & Doug line of toys, this Folding Medieval Wooden Castle will not disappoint. Your 5-6 year old son will enjoy hours of play with this dollhouse. By this age, no doubt, your son will enjoy adding heroes to his playtime (if he hasn’t already). Your 7-8 year old boy is sure to enjoy the dollhouses and characters included with these two sets. The KidKraft Everyday Heroes Play Set is the gold standard dollhouse for any 7-8 year old boys that love playing with heroes and saving the day. The 12 different rooms in this dollhouse offer a variety of different settings for your son to act out any number of different role-play situations. This dollhouse set also includes one policeman, one fireman, two dogs, and three vehicles – a motorcycle, helicopter, and firetruck. Your son’s friends will be bugging him to come over and play with this fun and unique playset. The dimensions are 38.2 x 10.5 x 26.5 inches, and it weighs just over 22 pounds. Overall, most parents highly recommend this dollhouse for their 7-8 year old sons. As long as you have the room for a play set this large, your son is sure to enjoy the imaginative adventures he can create. You’ll probably have a lot of fun too. Ahoy Matey! Your son will have hours of fun with this highly interactive pirate themed playset. From using the moving crane to place cargo from the house to the ship (included), to making the two cannons light up, he will enjoy the many adventures he creates for the four pirates (also included). The best part of the KidKraft Pirates Cove Play Set is all of the included add-ons. This is a perfect set to consider if you’re looking for an all-in-one option. The dimensions are 12 x 12 x 25 inches, and the total weight is just over 22 pounds. The KidKraft Pirates Cove Play Set is a fun addition to your 7-8 year old son’s toy collection. Although some parents had concerns about fostering negativity with this set, it appears that some gentle positive reinforcement was able to overcome any potential downfalls. At this age, most boys become increasingly intrigued with how things work, often taking things apart and putting them back together. 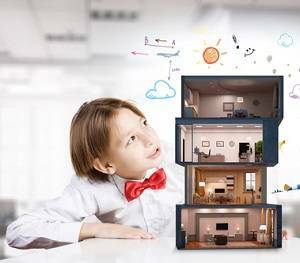 These options for 9-12 year old boys will allow your child to both build and play with their new dollhouse. Kids young and old (and even kids at heart) will love putting together this fun Lego set. Coming in at just over 3,500 total pieces, the Lego Ninjago Movie – City Docks set will provide your 9-12 year old boy with hours of fun putting it together, and then even more fun playing with it after constructed. This set is true to the quality and creativity synonymous with the Lego name. If you want to work with your son on developing their problem solving and mechanical ability, this Lego set will fit the bill. The dimensions are 22.9 x 18.9 x 4.9 inches (unassembled in the box), and it weighs just over 10 pounds. Although Lego recommends for ages 12 and up, most 9-12 year old boys should be able to handle the assembly of the Lego Ninjago Movie – City Docks set – especially with some adult help. If you enjoyed Legos growing up, you are sure to love the hours of fun building this set with your son. If you’re looking for a budget dollhouse option for your 9-12 year old son, the CuteBee DIY Dollhouse Kit is a great option to consider. Your son will enjoy building out this dollhouse set, and the finished product is just as enjoyable to play with. Depending on your son’s mechanical ability, it’s important to note that you will likely have to help him with some of the assemblies of this dollhouse. The finished dimensions are 20.5 x 24.5 x 15.5 inches, and it weighs just under three pounds. The CuteBee DIY Dollhouse Kit is a fun and challenging kit to tackle with your 9-12 year old son. If you and your son enjoy putting this dollhouse kit together, CuteBee offers several other kits as well. These are just some of the dollhouses for boys available today. Since every situation and family is unique, it’s important that you factor that all in when considering your dollhouse purchase. It’s also important to keep in mind the maturity and ability of your son when purchasing a dollhouse. If your son is more advanced, you may want to consider moving up an age range for their dollhouse. If you weren’t able to find what you were looking for above, Amazon offers dozens of different dollhouses and playsets that could be the perfect fit for your son.